When you’re in the market for a new SUV, choosing one may be a task. With so many available options for hitting the roads of Cerritos, Downey, and Long Beach, how do you know which one is right for you? 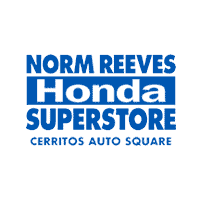 To offer some help in the arena, the pros at Norm Reeves Honda Superstore Cerritos are here to help. Below, we took two of the most popular models available and put them to the test. 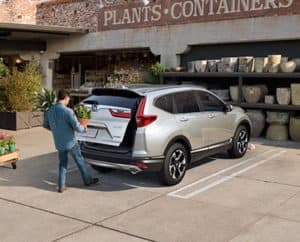 In our 2019 Honda CR-V vs. Toyota RAV4 comparison, you’ll be able to see the differences of each vehicle, allowing you to select the one that best meets your needs. Let’s get started. One of the most important aspects of driving a new car is making it your own. This shows off your personal style and elevates even the shortest commutes. However, when it comes to these two SUVs, one offers more room for optimal personalization. Exteriorly, the 2019 CR-V comes in 10 available body colors while the 2019 RAV4 only is available in nine. The Honda also offers bolder (yet still elegant) hues, featuring Molten Lava Pearl, Obsidian Blue Pearl, and Dark Olive Metallic. While the Toyota does offer hues of blues and reds, they are less unique, and green is not available. You can also customize your driving experience with more options under the hood of the CR-V. While the Toyota RAV4 comes with only one engine, the 2.4-liter 4 cylinder, the Honda CR-V comes with a choice of two. These include the 1.5-liter inline, as well as the 2.4-liter inline with a turbocharger, so you can choose which is best for your driving style. Interior Space – Which is Bigger? Though both of these SUVs can hold up to five people inside, there are some differences when it comes to interior space. The 2019 RAV4 is equipped with 98.9 cubic feet of passenger room. This includes a spacious front with 39.5 inches of headroom and 41 inches of legroom available. On the other hand, the Honda CR-V offers more room for everyone to get cozy. With an expensive interior volume of 105.9 cubic feet with 40.1 inches of headroom and 41.3 of legroom in the front, both you and your guests can stretch out even more. Additionally, the cargo area of the 2019 CR-V also beats out the RAV4: 39.2 cubic feet to 37.6 cubic feet, respectively. To make your drives as easy as pie, these two models come equipped with a suite of convenience features. Both come with smartphone integration, allowing you to access your phone while on the road. However, the CR-V comes with both Apple CarPlay™ and Android Auto™ while the RAV4 only is equipped with the latter. Additionally, while both vehicles can easily tow, the 2019 CR-V makes it a little simpler with pre-wiring for hauling. The 2019 RAV4 does not. 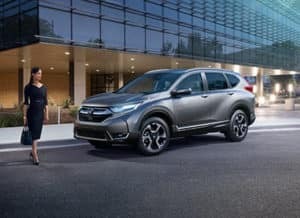 2019 Honda CR-V vs Toyota RAV4 – Have You Decided? After Norm Reeves Honda Superstore Cerritos has shown you some differences between these two SUVs, which one will better suit you? We truly believe you’re going to love being behind the wheel of the CR-V and want to prove that to you today! To schedule a test drive in the Cerritos, Downey, and Long Beach areas, contact us today!